Every day consumers are becoming more and more aware - and concerned - about the foods they eat. From allergy sensitivities to gluten intolerance, consumers are paying close attention to nutritional content and so is the USDA. CorTec and ChefTec comes preloaded with over 1,800 inventory items with full nutrient information. If you add additional inventory items use our Online Nutritional Analysis Service (NAS) to easily download nutrient detail from the USDA Nutritional Nutrient Database directly into your software. Search for nutrient information for a specific inventory item or search all of your items at once. Download all USDA or other sourced nutrient information directly into CorTec or ChefTec. Delivers a quick and accurate analysis of your recipes for fat, calories, nutrients and more. Calculates nutrition for any batch or serving size. Ensures you are in compliance. Displays Nutrient Content Descriptors (i.e., low fat, low calories, etc.) for each recipe. 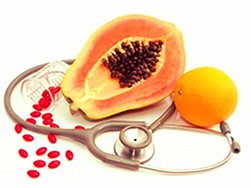 Provides data for the eight major allergenic foods - from milk and eggs to nuts and soybeans. Print NLEA-compliant "Nutrition Facts" labels for your recipes. 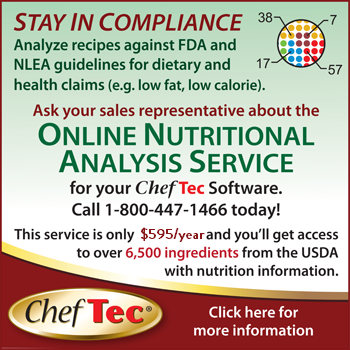 Seamlessly intergrated with your CorTec or ChefTec software, the Online Nutritional Analysis Service makes it easy for you to provide your customers with the answers to their nutrition-related questions. Stay in compliance and keep your customers happy, healthy and safe. The annual service costs just $595 per year.